Cauliflower is my current ‘it’ vegetable. I just can’t seem to get enough of it and, thankfully, my family feels the same way. We love it roasted or steamed. We’ve also been using cauliflower instead of potatoes in a lot of recipes. 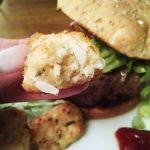 So when I recently had a craving for burgers and tots, I wanted to make something that would be a healthier lower carb alternative. Thus began my quest for cauliflower tot recipes. Thank goodness for Pinterest! 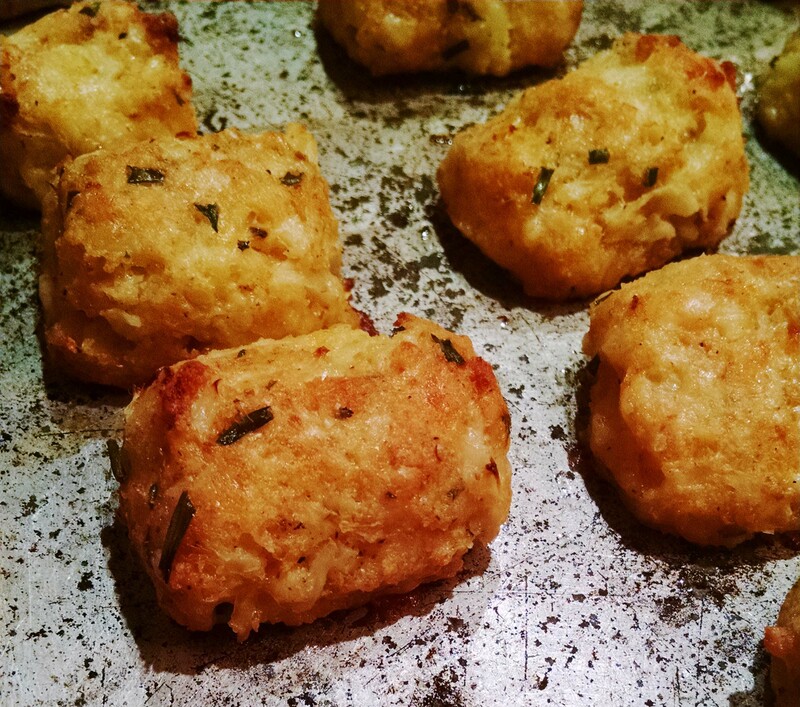 Bobbi’s Kozy Kitchen’s recipe for Cheesy Cauliflower Tots was the clear winner. Why? I had just about all the ingredients, her technique was spot on and her photograph of the tots had me drooling. She adapted her recipe from this one at Delish. I ended up using what I had on hand to come up with my own winning combination (which I couldn’t have done without the inspiration from Bobbi!). 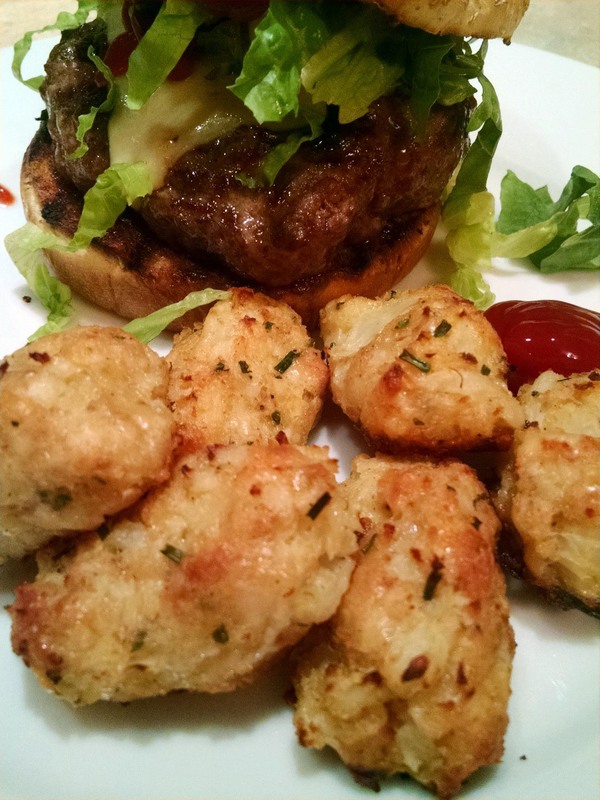 Grass fed beef burger, whole grain bun AND CAULIFLOWER TOTS!!!!! Preheat oven to 375F. Lightly coat a rimmed baking sheet with olive oil. Set aside. Boil cauliflower until just fork tender. Do not overcook. You want your tots to have a little texture. This should take about 5 minutes. Place the tender florets in a food processor and pulse until they are the consistency of a potato tot. Don’t over pulse. This next step is crucial. Spread the pulsed cauliflower onto a kitchen towel and squeeze to remove as much moistre as you can. Combine the cauliflower, egg, cheese, bread crumbs and spices in a bowl. Take a spoonful of the cauliflower-cheese mixture and place it in your palm. Form into a tot and place on a baking sheet. TIP: Put a drop of olive oil or two in your palm. Rub your palms together to lightly coat them with oil. This will make it easier to form your cauliflower tots. Keep going until you’ve made all your tots. Bake for 15-20 minutes until they’re golden. If you didn’t know this was cauliflower, you’d think it was a potato. See what I mean? Depending on the size you make them, you should end up with 20-24. These were so delicious. We now prefer them over the potato kind. Be warned: these are addictive. We had them with our burger and then continued snacking on them throughout the night. Mark LOVES meat so when he keeps going back for a veggie dish . . . well, you know it’s that good. 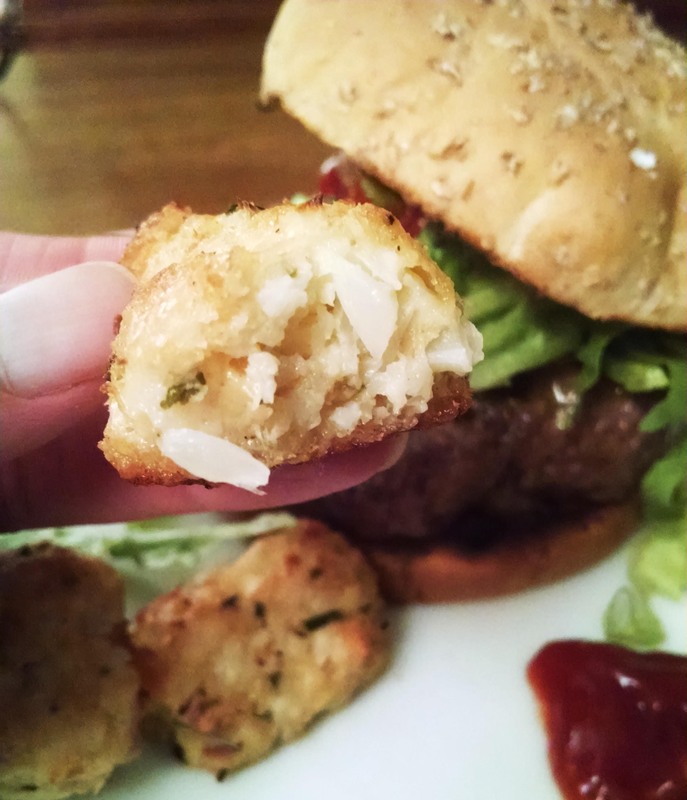 Try making these cauliflower tots for your family. You’ll be glad you did.